After most of PE items were glued on, I've stated putty work on both F2008 and MP4/30. Few PE items are left to attach to nose, but I can only do it after I finish putty work on it. I expect lots of sanding/puttying iterations ahead. Main reason I can work on multiple builds in parallel is that I have enough space. My work table is a big table from Ikea. Plus I have space on 2 smaller extra tables. All (well, most) of my started builds don't go further then hand reach and I can pick any of them and put it back into my working area basically any time. When I get tired or blocked on some build, I put parts into ziplock bags and put those back into kit's box. Then I put that box aside and reach for different one from those waiting around. 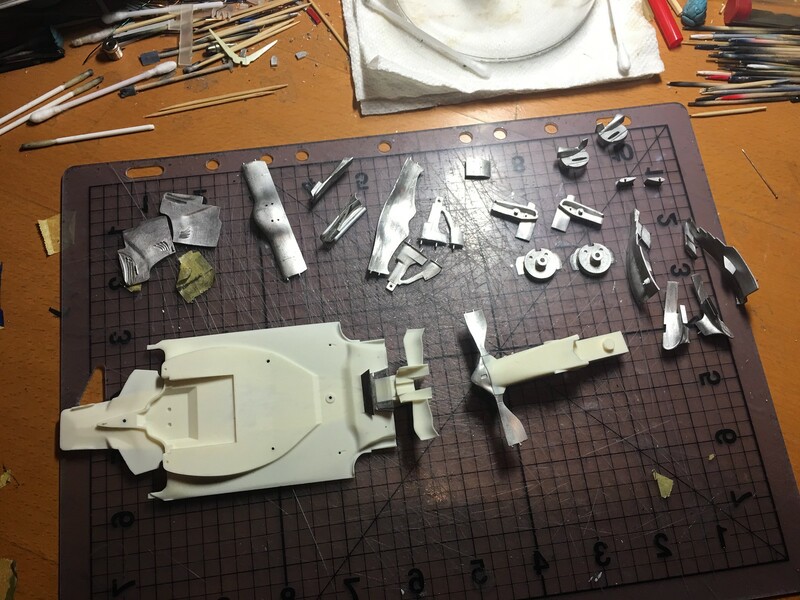 Exception are the parts already mounted for painting. Those I cannot put back into boxes and they stay around inserted into styrofoam blocks. It might feel and look strange for others, but for me it works best when I can jump to another build quickly, when I am tired of or blocked on current build. That keeps my motivation going. And when I get an extra motivation from one build, other builds benefit as well. I guess it leads to longer time to finish each single build, but my over all output is likely the same over time. By my nature I cannot stay on one single build too long. Lots of time spent over holidays on this build, but not much to show for it. Worked on preparation of parts and improving fit. Number of hours was spent on body panels' fit - bending, sanding, shaving and test fitting again and again. I feel that it is better now, even though on photos it might not be obvious. 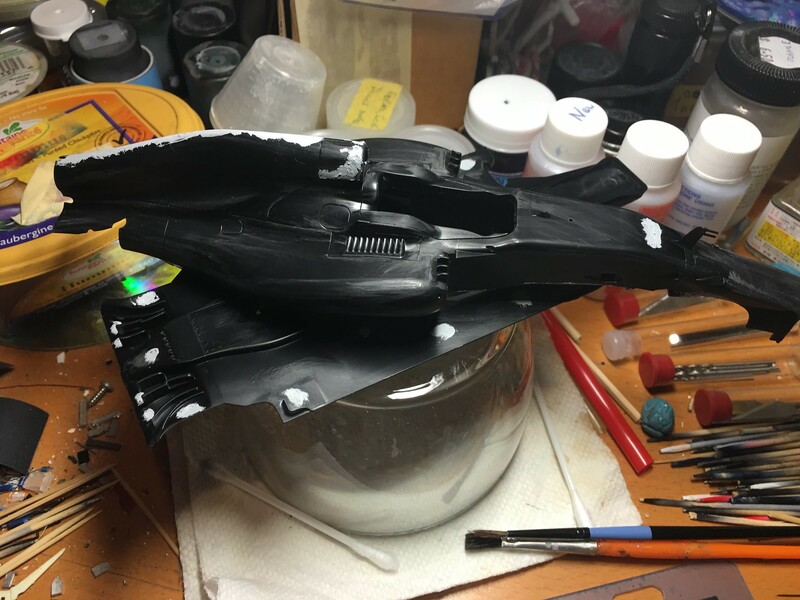 It will be important when everything is painted, decals are applied and final assembly commences. Next spent 3 hours trying to get right barge board to correct shape. Yet it wouldn't fit in place. After 3 hours I've decided to compare it to the left one and realized that connection point pin is about 1.5mm too much forward. No wonder it wouldn't want to fit. But 3 hours were already lost :( Corrected connection pin last night and it fits fine now. Also started assembly steps I could do before primer and paint. 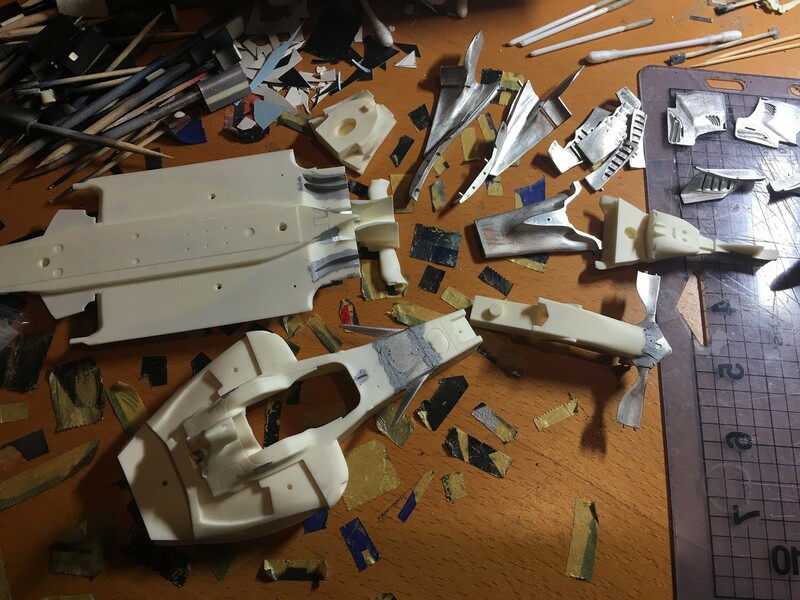 Assembled diffuser components, nose parts and adding different PE items at present. I naively hoped to get primer on during holidays, but there is a whole lot more work on it before it is ready for primer. 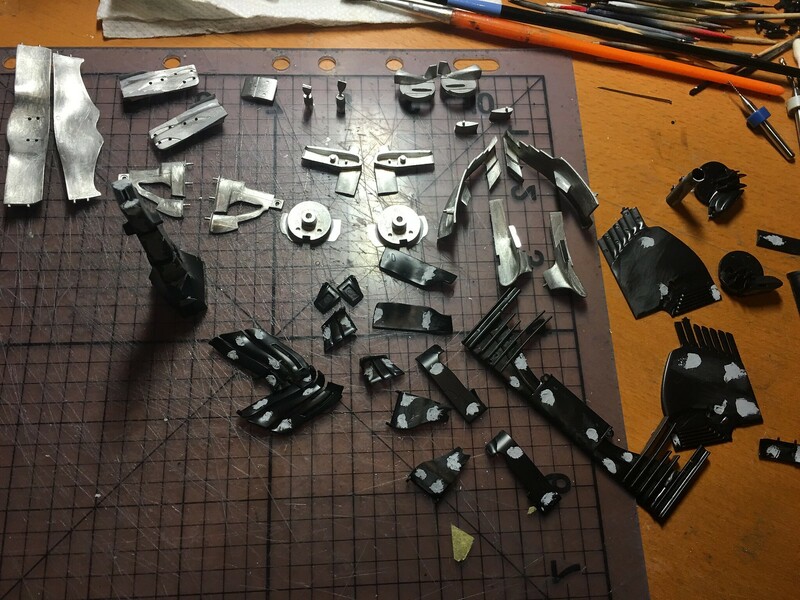 Quick photo of parts I am working on just to show at least something.